Malibu Country star Sara Rue looked gorgeous in a printed maxi dress at the Disney ABC 2013 TCA Winter Press Tour earlier this year. We have rounded up similar items so you can copy her celebrity mom maternity style. Sara Rue may no longer be pregnant (she welcomed her first child, a girl named Talulah, on Feb. 9) but we loved this gorgeous, bohemian look so much that we had to find out where she got this amazing dress. The actress has been frequently spotted on the red carpet wearing wrap dresses, which are a great choice for pregnant moms because they fit and flatter your curves. In fact, Rue wore regular clothes well into her pregnancy. “I'm not quite ready to move onto maternity gear yet,” she told Us Weekly. When she did move into maternity clothes, she picked printed frocks and maxi dresses that not only flattered her body, but were comfortable to boot. Rue looks gorgeous in the Tilly Maxi Maternity Dress (isabellaoliver.com, $147). This dress features a gorgeous ink print, as well as flattering bell sleeves and ties to fit and flatter throughout your pregnancy. 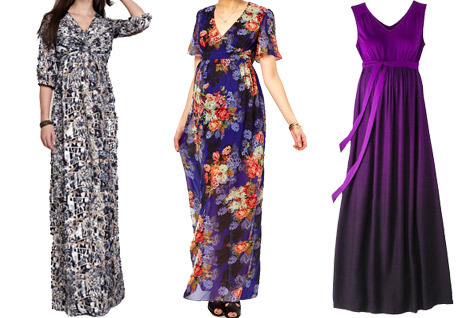 If you are looking for a dress that is more budget-friendly, you will love the vintage floral print in this ASOS Maternity Maxi Dress (ASOS.com, $79). This dress has the same v-neckline and flowing, fluid skirt that Rue's dress has. For a solid dress that has the same design, you will love the look (and price!) of the Liz Lange for Target Maternity Woven Maxi Dress in plum (target.com, $35). 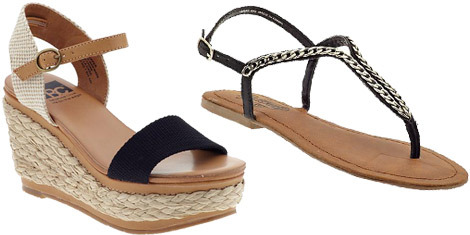 For those dressier occasions when you need a little height, wedge espadrille sandals are a good choice for pregnant moms-to-be because they give you more stability than regular heels. The Skin Deep by BC Footwear wedges (piperlime.com, $79) are neutral enough to be worn with just about any color of dress. Embellished flat sandals are another fabulous choice to wear with a maxi dress. One great option is the Golden Coin by Unlisted by Kenneth Cole (piperlime.com, $39). Rue gives her look some boho glamour with her hair braided across the crown of her head, while the rest of her hair is left in long, loose waves. If you can't quite master the side braid, wear a braided headband for the same look without the hassle. One great option is the Bellissima Braded Headband by Dancing with the Stars (amazon.com, $10), which comes in a variety of colors to match your natural hair color. Finish off your look with gold hoop earrings, such as the Made Bakora Kubwa Hoop Earrings with drop brass ringlets (ASOS.com, $33).